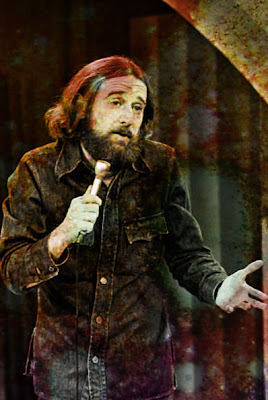 I had the great honor to meet George Carlin just a few years ago. He did a book signing at Copperfields, in advance of a Luther Burbank show. In fact, after that trip was when he entered re-hab..always thought a bender in Napa might have put him over the brink. That or the crack...but, really, he was such a nice man! OMG..the things people will say to a famous man, it was fun just to stand on line and hear him interact. He told the teenage boy in front of me that he ought to lighten up a little. I think the kid was in awe. 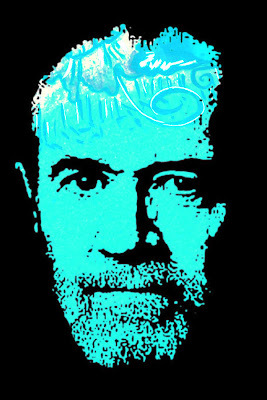 I mean, George f-in Carlin. In person. In Petaluma. When it was my turn, he called me Butterfly Girl because of a barrette I had in my hair. 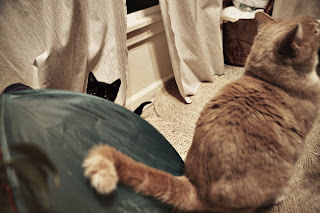 I think I made some crack to him about the mute boy before me..I don't really remember..I too was in awe. Here's a link to one of my all time favorites, the differences between Football and Baseball..classic!
" Is there another word for synonym?" Satisfaction of buying the cutest thing ever! Yeah..priceless..
"goods". So, I've started another blog where I will be posting new items for sale..ok there aren't any there yet..but there will be! :), be sure to check in often for the latest and greatest! A great love of mine..a hobby, a passion, a time and money killer..whatever you want to call it, but I love to find second hand treasures. My mom and aunts and grandma..etc..are all lifetime junkstore junkies..and I've been passed the torch. 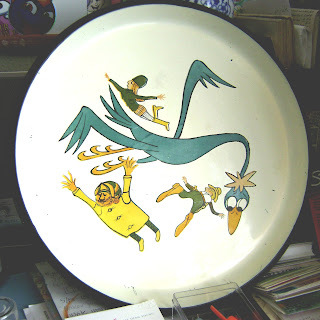 So, I thought I would start a weekly feature, showing off some of the goodies I find during the week..or, if it's a slow week, we can go into the archives (ie my frontroom! 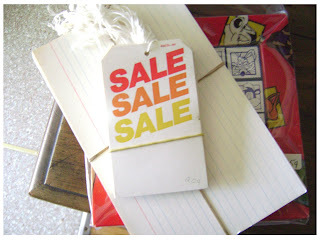 :)) These are my treasures from yesterday's thrift shop stop..I spent a whole $11.64. 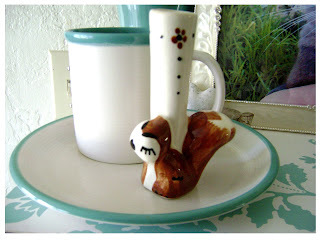 I got a set of cute japanese stoneware dishes, two mugs, two lil plates and two dinner plates..love the turquoise color on the rim!..and I found this cutie pie little squirrel bud vase I splurged on..it was a dollar! 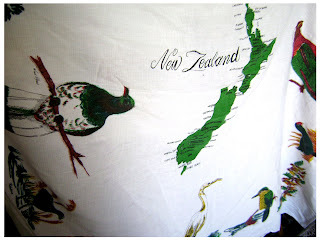 This is the center of an awesome linen tablecloth..and map of New Zealand! I had to have it because the whole border features all of the birds of NZ...love it! 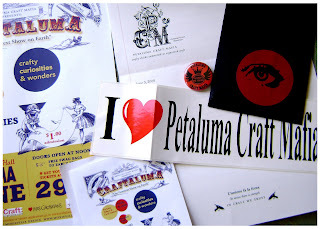 Well, I've been Made..made a member of the Petaluma Craft Mafia, that is! :) If you don't know about the Craft Mafia...well, where have you been? j/k...no, really, you can read more about it here; http://www.craftmafia.com/main.html. The Petaluma chapter was started and is run by Cheryl..love her! She's such a hoot! But, it's basically a group of small craft business owners who want to be able to market together, have fun and craft, craft, craft. 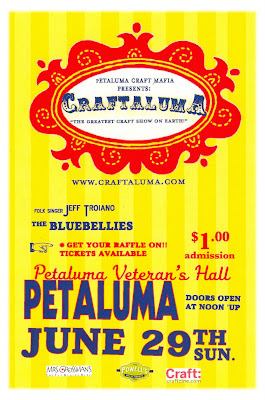 The Petaluma chapter is having a show at the end of this month, Craftaluma! It will be a sunday, June 29th from noon to 5! I'm so excited!! 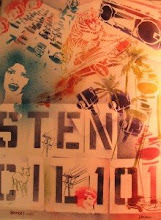 There will be crafty vendors, music, fortune telling...basically, the "Greatest Craft Show on Earth"..we're aiming high! We're still looking for a few vendors..you can find the application here; http://www.craftaluma.com/. I'll keep you posted and hope to see you there! and a few moments of silence of The Rock and Roll King.